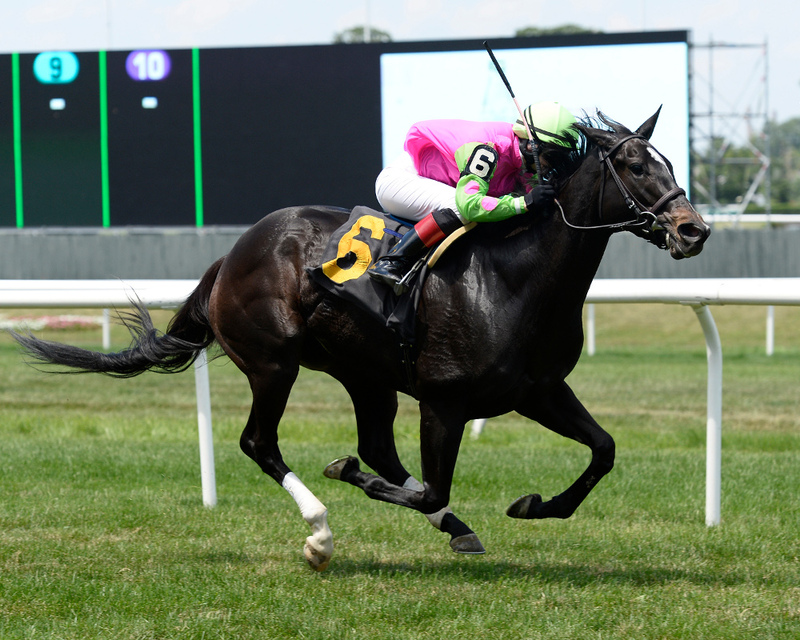 Getting the better of five rivals after a stalking trip, Patsy Symons’ Effie Trinket scored her first open company tally in Sunday’s $100,000 Diamondrella turf sprint overnight stakes for 3-year-old fillies at Belmont Park. After finishing a close-up third on dirt in her seasonal debut on May 2 for trainer Rick Violette, the dark bay daughter of Freud (Sequel Stallions) improved in her second start when she switched surfaces, beating eight older state-breds in a six-furlong turf sprint on May 30. Staying with grass in the Diamondrella, but stretching out an extra panel to seven furlongs, Effie Trinket was bet down to 9-2 third choice in a competitive field with jockey Rosie Napravnik in the irons. After the break Fearless Jacq came away with the lead and settled at the rail while Effie Trinket, also away well, set up shop in second in the two-path, a half-length behind the pacesetter. Shadowing the leader down the backstretch, Effie Trinket began her bid in the turn. Striking the lead in upper stretch and opening up a length advantage, Effie Trinket dug in in deep stretch to hold off a closing Bella Castani and get the victory by 1 1/4 lengths. After a half-mile in 46.88 and six furlongs in 1:09.70, the final time for seven furlongs over the firm Widener turf course was 1:21.23. A debut maiden breaker on a sloppy dirt track at Saratoga last August 10, Effie Trinket returned later in the month to win the Aristie for state-bred fillies over fast going before closing out her juvenile campaign with off-the-board efforts in the Grade 3 Miss Grillo and Chelsea Flower, both turf routes. 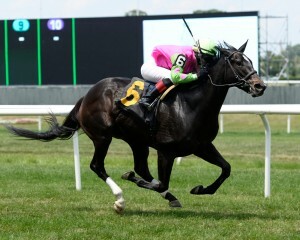 Adding her three 2013 starts, Effie Trinket’s record now stands at 7-4-0-1 with $202,150 in earnings. Effie Trinket’s Diamondrella victory gave her sire Freud (Sequel Stallions) his seventh progeny stakes winner and eighth stakes win of 2013. Bred by McMahon of Saratoga Thoroughbreds, where she was foaled, Effie Trinket is the fourth, and most successful, winner from four foals to start out of Maya’s Note, a winning Kentucky-bred daughter of Editor’s Note, whose dam, Miss Bid Flash (Horse Flash), is a multiple stakes winner and stakes producer ($242,185).